Corresponding secretary of the Council of Jewish Women; born at Chicago, March 3, 1862. Miss American has been connected with many philanthropic movements both in the general as well as in the Jewish community. She has been a member of the executive committee of the Chicago Civic Federation since 1896; member of the executive committee of the South Central District of Charities; vice-president of the Consumers' League since 1899; director of the Cook County League of Women's Clubs since 1899; chairman of the Vacation School and Playground Committee of Women's Clubs since 1896; president of the League for Religious Fellowship, 1897 and 1898. 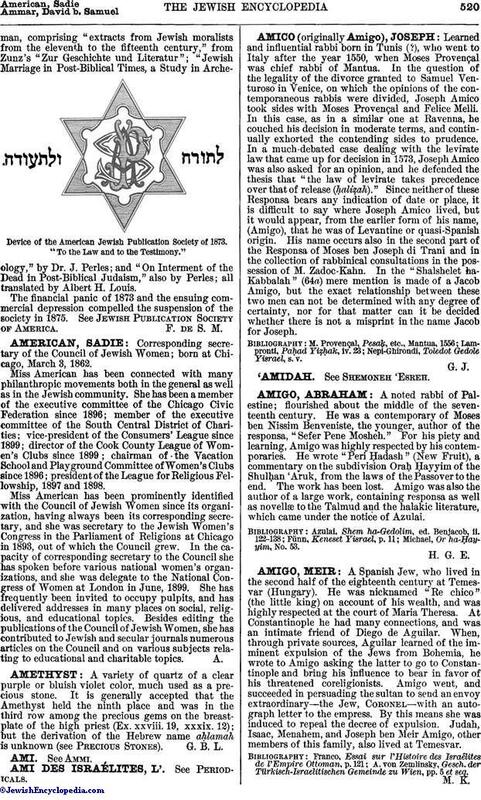 Miss American has been prominently identified with the Council of Jewish Women since its organization, having always been its corresponding secretary, and she was secretary to the Jewish Women's Congress in the Parliament of Religious at Chicago in 1893, out of which the Council grew. In the capacity of corresponding secretary to the Council she has spoken before various national women's organizations, and she was delegate to the National Congress of Women at London in June, 1899. She has frequently been invited to occupy pulpits, and has delivered addresses in many places on social, religious, and educational topics. Besides editing the publications of the Council of Jewish Women, she has contributed to Jewish and secular journals numerous articles on the Council and on various subjects relating to educational and charitable topics.